The ThinkSystem QLogic QML2692 Mezz 16Gb 2-Port Fibre Channel Adapter is an Enhanced Generation 5 (Gen 5) 16 Gb FC adapter for ThinkSystem blade servers. The adapter, based on Cavium technology, offer industry leading native FC performance with extremely low CPU usage with full hardware offloads. Enhanced Gen 5 FC technology provides advanced storage networking features capable of supporting the most demanding virtualized and private cloud environments, while fully leveraging the capabilities of high-performance 16 Gb FC (16GFC) and all-flash arrays (AFAs). This product guide provides essential presales information to understand the QLogic mezz adapter and its key features, specifications and compatibility. 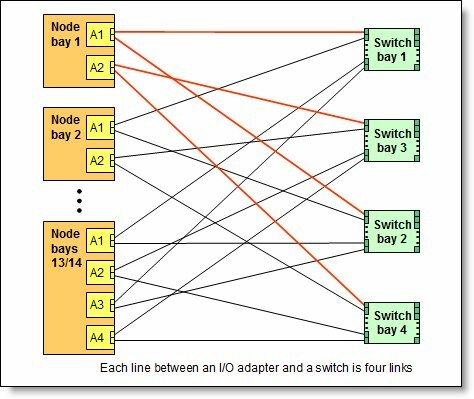 This guide is intended for technical specialists, sales specialists, sales engineers, IT architects, and other IT professionals who want to learn more about the adapter and consider its use in IT solutions. 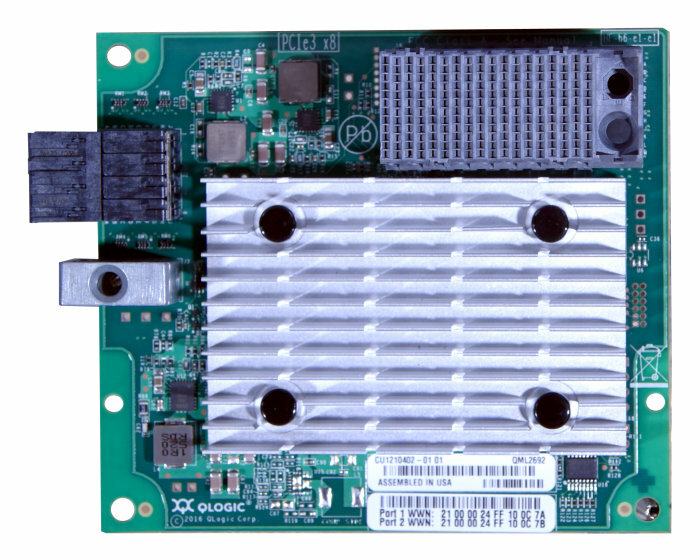 The following figure shows the ThinkSystem QLogic QML2692 Mezz 16Gb 2-Port Fibre Channel Adapter. The Cavium StorFusion architecture delivers ultimate reliability to meet the needs of mission-critical enterprise applications with lower power and fewer CPU cycles, all while maintaining peak performance. The QLogic 16Gb Enhanced Gen 5 mezz adapter is based on a 32 Gbps ASIC, which delivers higher IOPS and performance with lower power consumption compared to previous generation. QLogic QConvergeConsole provides unified, single-pane-of-glass management across generations of QLogic FC adapters. The following table shows the part number to order these adapters. Maximum performance with up to 1.3 million input/output operations per second (IOPS) to support larger server virtualization deployments and scalable cloud initiatives, and performance to match new multicore processors, SSDs/flash storage, and faster server host bus architectures. Independent function, transmit and receive buffers, an on-chip CPU, DMA channels, and a firmware image for each port enable complete port-level isolation, prevent errors and firmware crashes from propagating across all ports, and provide predictable and scalable performance across all ports. Support forward error correction (FEC) to enhance reliability of transmission and thereby performance. Industry-standard class-specific control (CS_CTL)-based frame prioritization Quality of Service (QoS) helps alleviate network congestion by prioritizing traffic for time-sensitive mission critical workloads for optimized performance. Fabric-assigned port worldwide name (FA-WWN) and fabric-based boot LUN discovery (F-BLD) pre-provisioning services allow servers to be quickly deployed, replaced, and moved across the SAN; the creation of zones, LUNs, and other services can be completed before the servers arrive on site. Using the Brocade ClearLink diagnostic port (D_Port) available on the Brocade Gen 5 switches, administrators can quickly run automated diagnostic tests to assess the health of links and fabric components. Read diagnostic parameters (RDP) feature provides detailed port, media, and optics diagnostics to easily discover and diagnose link-related errors and degrading conditions on any N_Port-to-F_Port link. Single-pane-of-glass management across generations of QLogic FC adapters with QLogic QConvergeConsole (QCC). Deployment flexibility and integration with third-party management tools, including the VMware vCenter and Brocade Network Advisor. A common driver model allows a single driver to support all QLogic HBAs on a given OS. Backward compatibility with existing 4Gb and 8Gb FC infrastructure, leveraging existing SAN investments. Allow application of SAN best practices, tools, and processes with virtual server deployments. Ensure data availability and data integrity. The QLogic unified management application, QLogic QConvergeConsole (QCC), provides single-pane-of-glass management across generations of QLogic FC adapters. QLogic supports all major APIs for deployment flexibility and integration with third-party management tools, including the VMware vCenter and Brocade Network Advisor. The adapter is supported in the the ThinkSystem compute nodes as indicated in the following table. The adapters support the I/O module that is listed in the following table. One or two compatible switches must be installed in the corresponding I/O bays in the chassis. Installing two switches means that both ports of the adapter are enabled and connected to switch ports. The connections between the adapters that are installed in the compute nodes to the switch bays in the chassis are shown in the following figure. The adapter carries a one-year limited warranty. When installed in a supported server, the adapter assumes the server's base warranty and any Lenovo Services warranty upgrade.